So, when you get red spots on your skin, first you have to check and identify the exact reason behind it. This helps you to treat and cure it in the proper way. Exposure to sun is not good when you have red spots on your skin. The harmful rays of the sun can accelerate the formation of red spots and make things even worse. The sun’s rays can cause damage to the skin and they also lead to the production of excess melanin in the skin on the areas affected with red spots. In addition to all these problems, they also cause sun burns and other skin issues. This leads to a slowdown in the process of fading and lightening of the red spots. Hence, it is recommended that you always apply sun screens and cosmetics containing SPF when you go out in the sun. This will protect you from the UV rays of the sun. You can also carry an umbrella when you step out in the sun. One of the natural ways to fade away red spots is to exfoliate the affected area of your skin regularly. This will trigger discoloration and fading of the red spots. Exfoliating the skin helps in getting rid of dirt, dead and dry skin that have collected on the epidermis, and unwanted oil on the epidermis, which interfere with the lightening process of red spots and make the process of red spot removal slow. By exfoliating your skin, the new and healthy layer of skin is exposed. So, with regular exfoliation, you will get flawless and clear skin without any spots. Remember to scrub and exfoliate your skin using natural and organic products. Pumice stones, wash clothes and natural scrubs may be used for exfoliating the skin. Chemical process may also be followed provided that they do not harm your skin in any way. Exfoliation removes unwanted cells from the skin surface and makes your skin look fresh and revitalized. Red sots on the skin may also be due to genetic reasons. Some people have them by birth, like birth marks. When this is the reason, it is not possible to remove them by natural methods. For such people surgery is the only way to remove red spots on the skin. 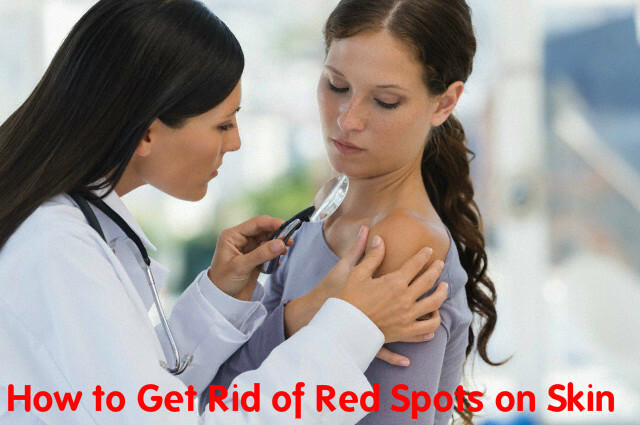 You can also treat red spots by using medicines and ointments. Skin creams like calamines, laser treatments, surgical process and other medical and clinical alternatives are also useful for lightening and getting rid of red spots on the skin. Some of the natural ingredients help you to treat and get rid of red spots. Mulberry extracts, kojoic acid, oatmeal, liquorices extracts, witch hazel, lavender oil, tomatoes, potatoes etc as well as products that are rich sources of Vitamin C and E are good toners and astringents. They are very effective in lightening and fading the red spots on the skin. You will get a smooth and healthy skin without any marks or blemishes after you treat your skin with these ingredients. Following a healthy and well balanced diet is a must for getting healthy and clear skin that is devoid of any red spots. If the diet you have is unj-healthy and lack the essential nutrients, this can lead to allergies of the skin, acne, digestive problems, pimples, dry skin and so on. These can lead to the appearance of red spots on the face and the body. To avoid such a situation, you must have a proper diet that is rich in vitamins, protein, minerals, essential oils and other nutrients needed for a healthy body and skin. These increase the immunity power of the body and help to fight against these diseases. Using of artificial cosmetics for a long time and using it excess amounts can cause red spots on the skin. The chemicals contained in personal hygiene products like powder, lipstick, soap, lotion and so on are not good for the skin. If these products are of cheap quality, then they are even more harmful for the skin. This is because of the corrosive and unhealthy ingredients in these products. Therefore it is advised that you use only those cosmetics that are made with natural ingredients and nourish your skin. This way you can avoid various problems of the skin like rashes, red spots, allergies, acne and so on. Another thing to remember before you buy a cosmetic product is to check its expiry date. If you apply products whose expiry date is over, it may lead to harmful chemical reactions on your skin and the appearance of red spots and other such symptoms on the skin. For get rid of red spots on face try to use Dermalmd glowing serum. I definitely see improvement in my skin when I use this serum consistently. It helps even the tone, reduce the appearance of red spots and my breakouts tend to be better, not completely gone, but definitely better. It isn’t sticky during application.